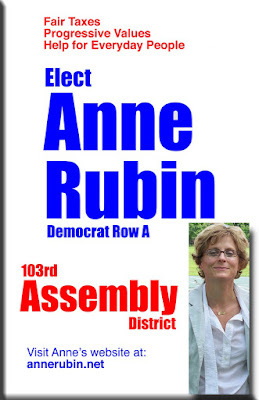 HUDSON DEMOCRATS UNANIMOUSLY ENDORSE ANNE RUBIN FOR ASSEMBLY! At the last meeting of the Hudson City Democratic Committee, the committee unanimously endorsed Anne Rubin for Assembly in the 103rd AD. Anne entered the race with only 9 days left for petitioning ended. She and her supporters collected more than double the required number of signatures in just over a week, a stellar feat. She has been attending many community forums and meetings in order to understand the complexities of the district and will make a great new Assembly Member in November. There will be a fund raiser for Anne in Hudson in the very near future. Watch this site for details.